Jesse asks: What will happen when the earth’s magnetic field switches? 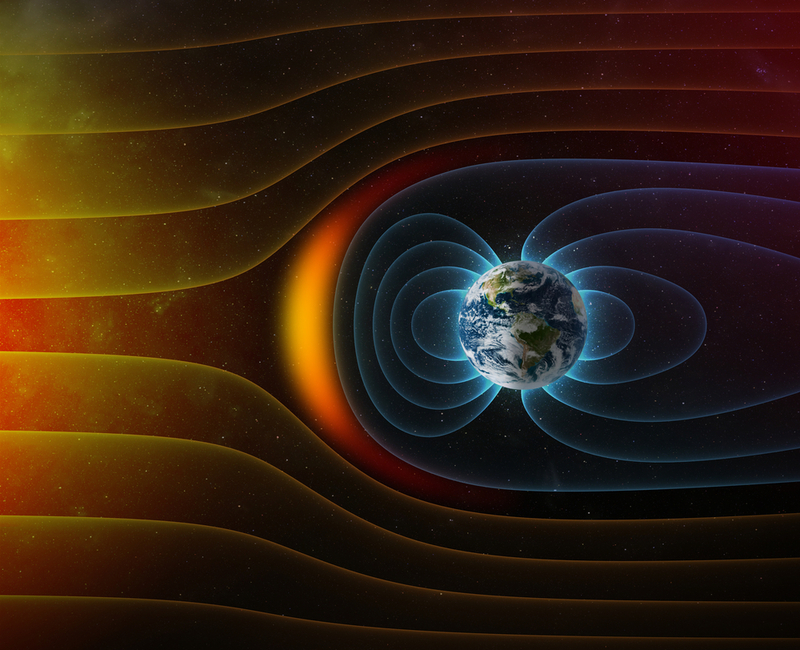 The Earth’s magnetic field protects life on Earth, shielding it from damaging radiation and moderating our climate. So the idea that it could completely flip around, or collapse altogether, should cause us to worry, right? Well, yes and no. The result of electrical currents generated deep within the Earth through dynamic action, the magnetosphere is a fluid force that is constantly changing in strength and orientation. The very heart of our planet is a solid inner core of mostly iron that is about the size of the moon. It is so hot (9000°F to 13000°F or about 5000°C to 7200°C) that its temperature equals that of the “surface” of the sun, but it remains solid because of the combined pressure of everything above it being pulled toward it by gravity. Surrounding this solid inner core is a second layer made primarily of an iron-nickel alloy. Nearly as hot (7200°F to 9000°F or about 4000°C to 5000°C) but under a bit less pressure, this outer core is liquid. Around the outer core is a hot layer of dense rock, called the mantle, that “flows like asphalt under a heavy weight.” At temperatures ranging from 1600°F (871°C), where it meets the Earth’s crust, to 4000°F (2204°C), where it meets the outer core, it is relatively cool compared to its deeper, denser neighbors. There needs to be a 2,700-degree F (1,500C) difference between the inner core and the mantle to spur “thermal movements” that – along with Earth’s spin – create the magnetic field. Given the fluidity of the system, it stands to reason that the magnetic field is not an immovable constant, but changes in its strength, orientation and polarity. Since it was first pinpointed in 1831 by James Ross, the magnetic north pole has moved more than 600 miles, and in recent years, this change has accelerated from “an average speed of 10 km per year . . . to 40 km per year.” It is expected to move from its current location in North America to Asia within a few decades. Radiation at ground level would increase . . . causing more deaths from cancer . . . but only slightly . . . . Electric grid collapse from severe solar storms is a major risk . . . [and] the Earth’s climate could also change . . . . Some speculative studies have suggested that as the Earth’s magnetic field weakens we could see an increase in cloud coverage in the troposphere and an increase in the polar ozone holes . . . .
Part of the natural order, over the last 20 million years, the poles have reversed, on average, every 200,000-300,000 years. However, we are long overdue for a long-term reversal, since the last one occurred about 780,000 years ago. It’s not a sudden flip, but a slow process, during which the field strength becomes weak, very probably the field becomes more complex and might show more than two poles for a while, and then builds up in strength and aligns in the opposite direction. Given the field’s waning strength over the last couple of centuries, some scientists believe we are approaching another long-term flip. 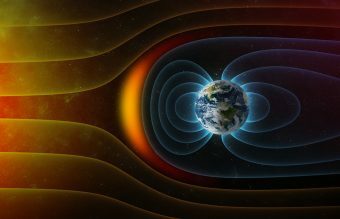 Many downplay the risk to humans, noting that the magnetosphere rarely disappears, so life on Earth remains largely protected during the reversal. In recent years, scientists have found evidence that magnetic pole shifts can occur very quickly, although it is not clear if they typically result in complete reversals. In the late 1960s near the village of Laschamp in the Massif-Central in France, scientists found incomplete evidence that led them to believe an extremely rapid, short-term magnetic reversal had occurred a mere 41,000 years ago (about the time the Neanderthal disappeared from Europe). The field geometry of reversed polarity, with field lines pointing into the opposite direction when compared to today’s configuration, last for only about 440 years, and it was associated with a field strength that was only one quarter of today’s field. . . . During this period, the field was even weaker, with only 5% of today’s field strength. As a consequence, Earth nearly completely lost its protection shield against hard cosmic rays, leading to a significantly increased radiation exposure. Numerous abrupt climate changes during the last ice age [were happening along with] . . . the largest volcanic eruption on the Northern hemisphere in the past 100,000 years . . . near Naples, Italy . . . [and the] short and fast reversal of the Earth’s magnetic field. Are the Earth’s Poles About to Flip? What if Earth’s Magnetic Poles Flip?